Fudge, tea rings, macaroons, baklava, pralines, and brittles! These are some of the nutty holiday sweets we indulgence in this time of year. 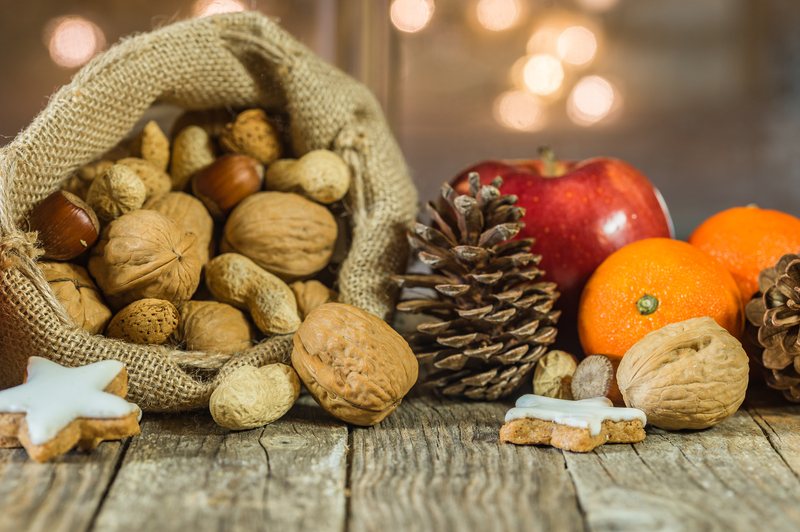 Besides these delectable offerings, unshelled nuts to be eaten in their natural state are common around the holiday season as well. I'm going to date myself, but stockings at my house didn't have toys, but a wonderful mixture of fruit, nuts and candy. The preponderance of nuts in the fall and early winter of course relate to the natural time of harvest- and a reason why so many holiday recipes call for them. To a botanist, a nut is a hard surfaced fruit containing a seed (the part we eat). Most people refer to this edible part as the nut; so before we get too nutty about it; let's agree that anything you think is a nut is a nut- except for peanuts, which are actually legumes! Many nuts we enjoy, including pistachio, macadamia, almonds and cashews, grow in warm and even tropical climates. In Eastern North America we are lucky enough indeed to have a few native nut (trees) of our own, and the opportunity to grow them successfully. The filbert (hazelnut) is a great one, American Chesnut hybrids immune to Chesnut blight, and the hardy Northern Pecan grown a little farther south of here are the more common ones. A tree we are likely most familiar with is the Black Walnut (Juglans nigra). Once ubiquitous in our surroundings, this tree is often scorned as messy and a bad team player in our urban landscapes. Yes, some plants are sensitive to the chemical jugalone it produces, (those in the nightshade family come to mind), but way more species are actually okay with it. Black walnuts don't make themselves easy to love either when it's time to harvest. Thick outer husks and hard inner shells make them, let's say 'challenging' to get to the nut meat. Driving over the husks with a car back and forth or pounding them a mallet are common ways! That's why they are hard to find in many a grocery store, and expensive when you do. BUT…. These nuts are so, so good; with more intense and slightly tangy taste than the imported English Walnut, you'll want them in your special dishes anytime of the year. Plus, there is a certain satisfaction experienced when the work is worth the effort. Try purchasing them this year to try in your favorite recipe; and maybe next year you'll be Black Walnut hunting the way some people morel mushroom hunt. The walnuts are easier to find, and are deee-licous!